This biography of Mark Twain is not like any other biography you'll ever read. 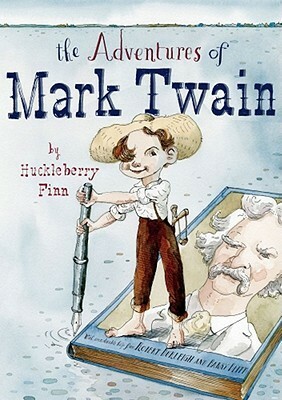 It is told from the point-of-view of Twain's most famous fictional character, Huckleberry Finn. Narrated in Huck's distinctive, unlearned voice, this book is sure to surprise and delight big kids and little kids alike. I might be so bold as to say that I don't think I've enjoyed a piece of nonfiction text more than this one. I spent most of my time reading this book laughing out loud and sharing entertaining passages with my husband who was watching TV and had to pause the DVR on many occasions just so I could read out loud to him. Livy was always askin' Sam to talk about his days on the Mississippi. Maybe it was this that got his rememberies up. There's no knowin' for certain, but in the end his famousest book is about times when he was a boy. The Adventures of Tom Sawyer (wherein I plays a very important part myself, if it don't seem like peacockin' to say so) tells about the doin's of a boy, sorta like Sam was way back.